Although Scipio ERP is built to integrate with other software applications, Apache Camel extends on the base functionality and makes the process a lot more versatile. 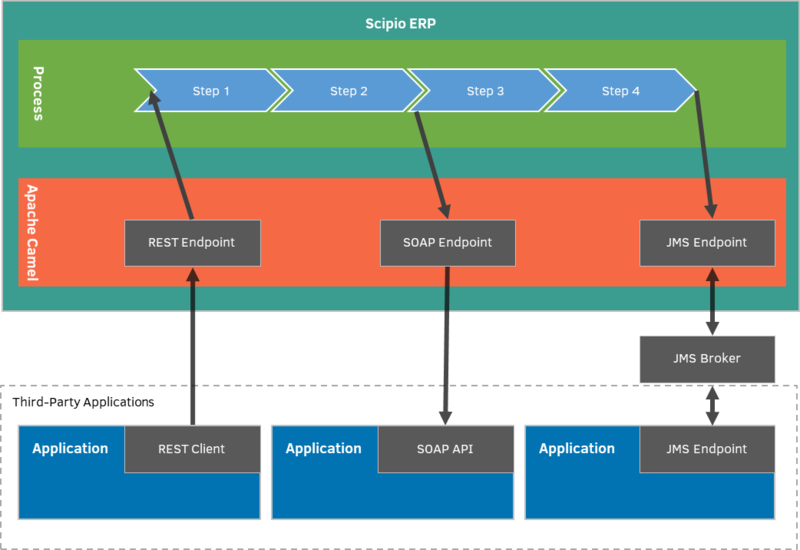 Whereas you can use Scipio ERP with SOAP, or REST-like services out-of-the-box, Camel empowers you to use the broad variety of protocols supported by Camel to expose your services or use external services. Apache Camel is an extensible integration framework which transforms and routes messages from and to different endpoints. The supported protocols and APIs include AMQP, many Amazon Web Services, DNS, Filessystem, (S)FTP(S), Geocoders, Hadoop, IMAP/POP/SMTP, LDAP, JMS, MQTT, REST, SOAP, SSH and many others. Using a simple domain-specific language (available as Java or XML dialect), you can now expose your internal Scipio service (e.g. creating an order on receiving an e-mail, adding new customers over the AMQP, etc.) over one or many of the aforementioned protocols. You can also use the Camel component to integrate external services into your business processes. Using an SECA (Service Event Condition Action), you could easily update your CRM data using the Salesforce API (using the camel-salesforce component) whenever a customer updates her/his shipping address.